I have a lot to say but not the energy or time to say it. I will save the more verbose post in me for another day, but let me just break the fast with you! Oats are an incredible power food. Not only are oats a great fibre source, they work on many fronts to make us healthier. Their phytonutrients help prevent cancer, they lower blood pressure and improve bowel function, they are fantastic for heart health and cholesterol, they spread out your insulin response and regulate blood sugar, and they can favourably alter metabolism and aid in weight loss as well as athletic performance! With a reputation like that, why wouldn't you bring oats on side as a regular part of your diet? Don't just take my word for it. There's a ton of research out there, just waiting for you to read. Here's a good place to start. And this article in the Epoch Times talks about even more pros for oat consumption... even the benefits of oat straw tea! (Who knew?!) They say "Research carried out in Australia showed that athletes who were fed on an oat-based diet over a three-week period showed a 4 percent increase in stamina, according to The Encyclopedia of Medicinal Plants. This is in part due to the fact that oat-seed is endowed with good amounts of vitamins B and E and a rich supply of minerals including iron, potassium, and calcium. This combination both tones and stimulates muscles as well as the nerve supply to those muscles....If it takes you days to recover after a physically exhausting training session, then a cup of oat-straw tea may be just what you need. I would also add growing children to this group as they are especially in need of protein for building body tissue and vitamin E for optimum cell division, all found abundantly in oats." I haven't tried oat-staw tea, but they say to use 2 teaspoons oat straw to 8 oz water. I'll give it a go! I've been making an effort to eat oats more regularly. I grew up with the traditional brown sugar and milk as a topping, but in recent years have eschewed that in favour of healthier options. Fruit, nuts, or a savoury soft basted egg with salt and pepper all make great additions to oats. This morning's oats were a treat! As soon as I took them from the heat I stirred in chopped strawberries an a big handful of blueberries. I topped it all off with a splash of almond milk an a drizzle of real maple syrup. Decadent! A great way to start a Saturday. Here's an inspired (if a little insane!) 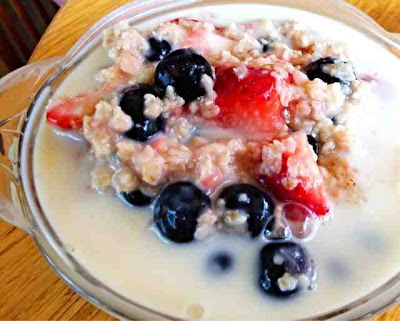 blog dedicated entirely to... you guessed it... oats! Check out http://oatmealeveryday.blogspot.ca for inspiration and recipes to take your daily dose of oats from meh to MMMMMmmm. What's your favourite way to dress up your oats?